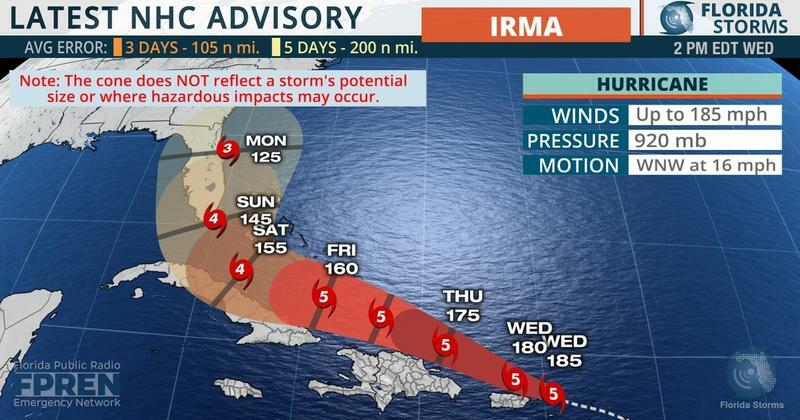 Duval is requiring mandatory evacuations in Zones A and B, mobile homes and low-lying areas as of Friday morning, affecting about 250,000 residents. Look up a house's evacuation zone at JaxReady.com. Officials say everyone should be wherever they plan to ride out the storm by 8 p.m. Saturday. Clay County residents who live in Flood Zones A, B, and C are under a mandatory evacuation order. The order also includes anyone who lives in a mobile home, regardless of zone. Find our your zone at alert.claycountygov.com. St. Johns County has issued a mandatory evacuation order with a deadline of 6 a.m. Saturday, Sept. 9, for Evacuation Zones A and B, which includes the entire City of St. Augustine, the Town of Hastings, and those living on waterfront property, in boats, RVs, or mobile homes throughout St. Johns County. Look up a house's evacuation zone here. Residents who are able to evacuate and are not utilizing a St. Johns County shelter should begin evacuating as soon as possible prior to Saturday in order to avoid traffic congestion. Nassau County has ordered mandatory evacuations for people in Zones A, C and F beginning Friday at 6 p.m..
See which zone you live in on this map. Nassau County Emergency managers say they’ll make the decision about closing the Shave Bridge when sustained tropical-force winds reach 35 mph. As of 1:30 p.m. Saturday, the Legends Center had reached capacity. “If you’re in those evacuation Zones A or B and you can’t leave for whatever reason, know that there are shelters that you’ll have identified and you can begin moving there on Friday,” the mayor said. For information about Duval County evacuation shelters, such as what to bring with you, to register for our Special Needs Shelters, or to pre- arrange for transportation to an evacuation shelter, visit www.jaxready.com or call 630-CITY (630-2489). Clay County’s shelter for people with special needs at Lake Asbury Junior High in Green Cove Springs is at capacity. The county will open a second special needs shelter at 1:00 pm Sunday at Thrasher-Horne Center,283 College Drive, Orange Park, FL 32065. It’s only for those who have registered with the county. ​Note: Pet owners must crate their animals when going to pet-friendly shelters. Some area pet supply stores have limited amounts of crates left. Pedro Menendez High School, 600 SR 206 W., St. Augustine (General population) As of 9 a.m. Sunday, Pedro Menendez High had reached capacity. People without pets or special needs are urged to seek shelter at Bartram Trail High or Mill Creek Elementary. All schools and offices closed and all after-school activities and Extended Day care canceled on Monday, Sept. 11, and Tuesday, Sept. 12. Schools and district offices will be closed Monday, Sept. 11, and Tuesday, Sept. 12. Baker County Public Schools will be closed Monday, Sept. 11. Schools and district offices will be closed Monday Sept. 11. In Southeast Georgia, Camden County Public Schools will be closed Monday, Sept. 11, and Tuesday, Sept. 12. All official announcements regarding schools will be made on Camden County Schools website and Facebook page, through SchoolMessenger automated calls, as well as on local radio stations KBAY 106.3 and WECC 89.3. Classes, most events and non-essential operations are canceled Friday, Sept. 8, through Tuesday Sept. 12. The cancellation also includes all online classes. Normal operations will resume on Wednesday, Sept. 13. The university will be closed starting Friday, Sept. 8, with plans to resume normal operations on Wednesday, Sept. 13. Any classes, activities, or events that were scheduled to be held on campus between Sept. 8 and Sept. 12 have been canceled. All FSCJ campuses and centers are closed as of Friday, Sept. 8, through Tuesday, Sept. 12. They are scheduled to reopen on Wednesday, Sept. 13. Campuses are closed as of Friday, Sept. 8, and remain closed until further notice. College will be closed for all activities beginning Friday, Sept. 8, with plans to resume normal operations Wednesday, Sept. 13. Classes are canceled Thursday Sept. 7, through Tuesday, Sept. 12. Naval Air Station Jacksonville is closed to non-essential personnel beginning at noon on Saturday, Sept. 9. Only mission-essential personnel will have access to the base. Monday and Tuesday will be considered days of administrative leave for all personnel (active duty and civilian) assigned to the station. Naval Station Mayport's Main Gate will close at 6 p.m. Sunday. All personnel are advised to shelter in place until noon Monday. 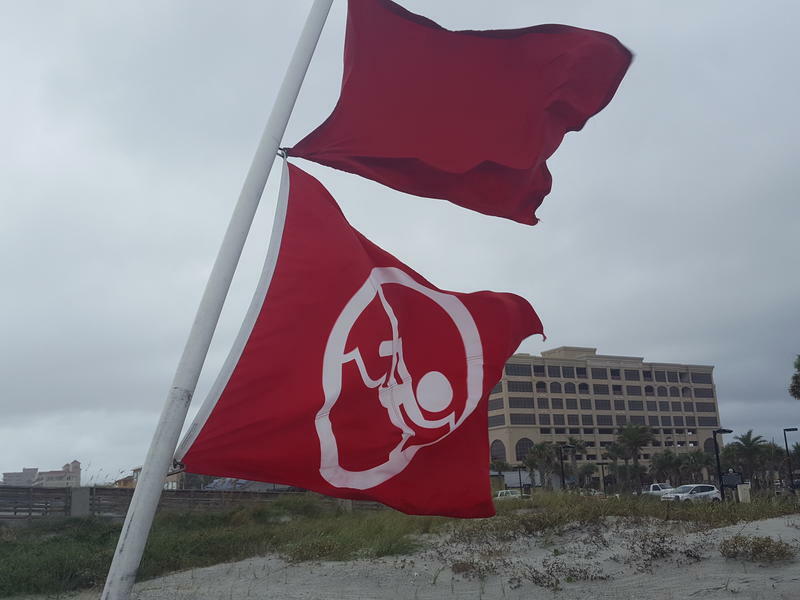 Administrative offices for St. Johns County, the City of St. Augustine, and the City of St. Augustine Beach will be closed Monday, Sept. 11. Operational decisions beyond Monday will be determined based on weather conditions. In addition, the city’s annual Ceremony of Remembrance for 9/11 and the regular St. Augustine City Commission meeting scheduled for Monday, Sept. 11, have been cancelled. The regular meeting of the Code Enforcement, Adjustments and Appeals Board (CEAAB) scheduled for Tuesday, Sept. 12, has also been canceled. All Jacksonville Public Library locations are closed Friday, Saturday and Sunday, Sept. 8, 9 and 10. The Osceola National Forest will close trails, campgrounds and recreation areas to the public on Friday at 5 p.m. until further notice. In addition, the Osceola ranger district office will be closed Monday and reopen at noon on Tuesday, Sept. 12. Jacksonville’s Museum of Science and History (MOSH) is closed beginning Friday, Sept. 8, until further notice. 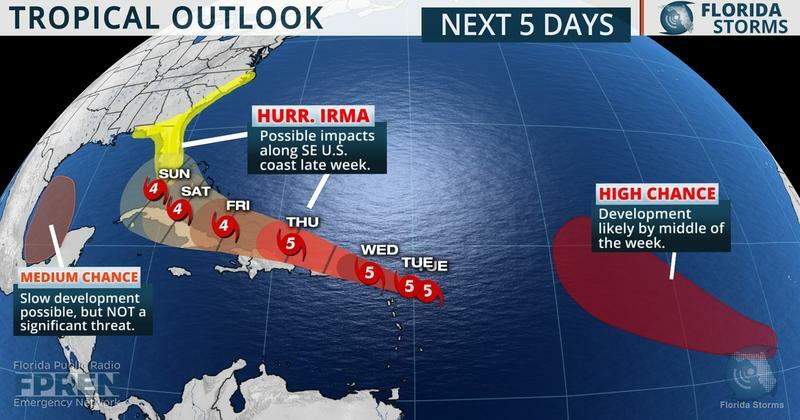 The YMCA of Florida’s First Coast will close all branches all day from Saturday to Monday, and plan to open branches at 2 p.m. on Tuesday, depending on the impact of Irma. YMCA Before and Afterschool Programs in Clay, Duval, Nassau and St. Johns County are canceled on Friday (Sept. 8) and Monday (Sept. 11). All Youth Sports programs scheduled for this weekend (Sept. 9-10) have been canceled. The McArthur Family YMCA Kids Tri has been postponed to Friday, Sept. 22. Registration has been extended. Contact the McArthur Y for more details. The St. Johns County Ocean and Fishing Pier will close Friday, Sept. 8, and will remain closed throughout the duration of the storm. All St. Johns County beaches are also closed to vehicles. JTA buses are operating on a Saturday schedule until midnight. JTA fixed route bus service will then be suspended and expected to resume on Tuesday, Sept. 12. JTA “Evacuation buses” are available to transport customers to designated shelters from these locations. Customers requiring special needs transportation to a shelter should call (904) 630-CITY. JTA’s customer service line is open today from 8 a.m. to 5 p.m. The hotline will open at 8 a.m. Sunday and remain open throughout Sunday night and into Monday to assist customers. St. Augustine’s Sing Out Loud Festival scheduled for Friday, Sept. 8 through Sunday, Sept. 10. The rest of the Sing Out Loud events set for Sept. 15 through Sept. 17 and Sept. 22 through Sept. 24 are scheduled to continue as planned. For updates regarding the Sing Out Loud Festival, please visit www.singoutloudfestival.com. St. Johns County residents with questions regarding Hurricane Irma are encouraged to call the St. Johns County Emergency Operations hotline at 904.824.5550 or visit www.sjcfl.us/hurricane for more information. St. Johns County has activated a hotline for residents and business owners with concerns regarding property and structural damage due to Hurricane Irma. If you have storm-related structural damage or permitting questions, call the St. Johns County Building Services Structural Hotline at 904-827-6836. Jacksonville Mayor Lenny Curry, along with beach community mayors, declared states of emergency Wednesday. That means the county will have access to resources and funds in case Hurricane Irma significantly affects the First Coast. Major Hurricane Irma is still a Category 5 storm and still a significant threat to the entire peninsula of Florida. Hurricane Irma has strengthened into a Category 5 storm as it roared toward the northeast Caribbean on a path toward the U.S.